Here are parts 1, 2, 3, 4, 5, 6 & 7. Well my friends, this morning was the last official feeding for Beowulf in the “starting the starter” category. But don’t worry, I’ll keep feeding him. This is what he looked like this morning. 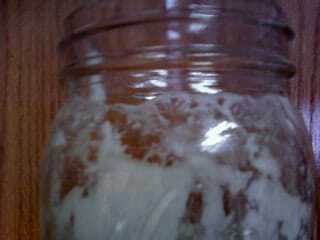 Do you see that line around the top of the jar? That is how far up it rose last night! Again, I’m a little excitable. Remember that the temperature, the size of your jar, and the level of your starter after feeding will determine how high it gets. 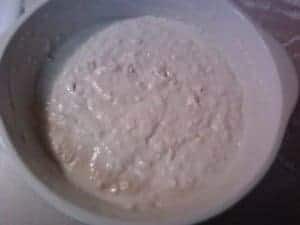 For this last feeding, I poured the starter into a bowl. I did not discard 1/2 of it this time. I added twice as much as I have been. This is the building up process that I talked about yesterday. This is what Beowulf looks like now in this stage. He is now covered with plastic wrap and sitting on my kitchen counter. You can use a bread cloth or a clean dish towel to cover your starter instead of plastic wrap. I do that a lot, actually. But today I have all the doors and windows open and I don’t want anything getting in it that shouldn’t be in it. While Beowulf is busy getting ready to be made into bread, let’s talk briefly about flour. This may come as a shock to you, (it did to me), but all flour is not created equal. Different types of grain make different types of flour which is better for different types of things. For making bread, the higher the protein content, the better your bread will rise. This is especially important when you are using a new starter. In general, unbleached flour has more protein than bleached. In general, bread flour will have more protein than most all-purpose flour. There are probably exceptions to these general rules. 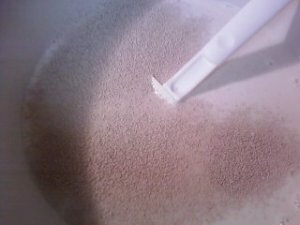 A few more general things about flour. 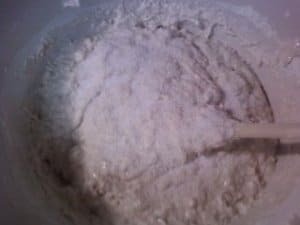 If you freeze your flour, (which is a good idea if you buy in bulk), make sure the flour is at room temperature before using it. When you open a new bag of flour, or if you just store it in the bag instead of a canister, use a knife or fork to stir and aerate it before you measure. When you measure a cup of flour that has settled, it can equal as much as 1 1/4 cup of aerated flour. 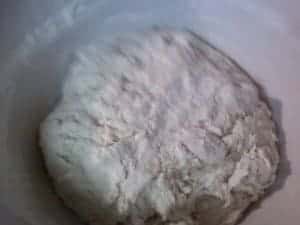 Whole-wheat flour will absorb more liquid than white flour. You cannot do a straight 1-to-1 substitution of whole-wheat flour for all the white flour in a recipe. You can usually get away with about a cup, depending on the volume of the recipe. After that, you have to fiddle with it to get it the right consistency. Most whole-wheat bread recipes have about 2 cups of white flour in them so that they rise better. 100% whole-wheat breads are very dense and chewy. And, lastly, temperature and humidity affect the flour’s ability to absorb liquid. That is why in bread recipes you don’t have an exact measurement for flour. Keep in mind also, that for sourdough recipes, how much flour you need will also depend on how thin your starter is. The thinner the starter, the more sour the final product. I use a fairly thick starter for everything I make, since we don’t like the really tangy stuff. One last thing. 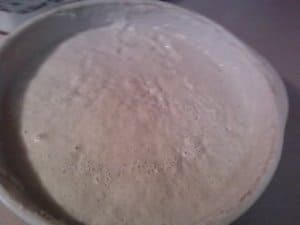 I mostly use my white flour starter for everything sourdough I make, so my recipes call for white flour. 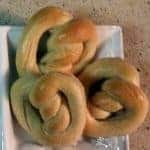 You can still use the recipes with whole-wheat flour, you will just have to experiment with them to get them to come out the way you want them. Enough about flour, let’s bake! This is what Beowulf looked like after the building up process. Stir down your sourdough starter and measure 3 cups into a large mixing bowl. You can see the thickness of the starter. Not runny, but not just a blob, either. Sorta in betweenish. 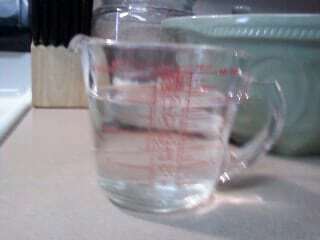 Add the 1 1/2 cups water. Mix that up until it’s smooth. This is where I add the yeast if I’m using it. You can put it in the water to dissolve, or sprinkle it over and mix it in. I’ve done it both ways and they both work. 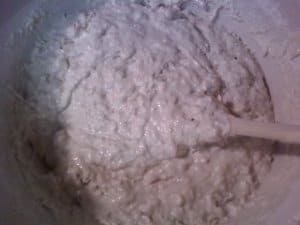 Mix the yeast in well. Then add 3 cups of flour. 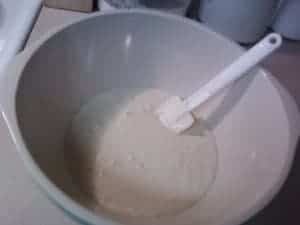 Mix the flour in until blended. Sprinkle the salt on top of the mixture. Salt can kill yeast, so I like to protect the yeast with some flour first. Mix the salt in well. 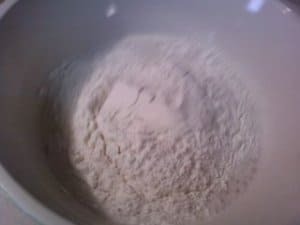 Continue to add flour a little at a time until it forms a ball. This was at about 4 1/2 cups. If I were using my stand mixer, I would be able to get more flour incorporated. I can’t mix in as much by hand. 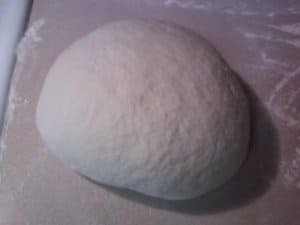 Now, turn your dough out onto a floured surface. 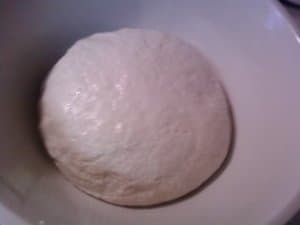 Knead the dough, adding flour as necessary, until the dough is no longer sticky. You can also do this step in the stand mixer with the dough hook. Today is in the low 70’s and humid. I ended up using almost 6 cups of flour today and kneaded for about 15 minutes. 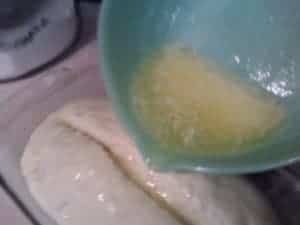 Oil a bowl and place the dough in it. Turn the dough over so that the top is now oiled. I like to use the same bowl for rising that I use for mixing. After I turn the dough out, I put my bowl in the sink and run hot water into it. That does two things. 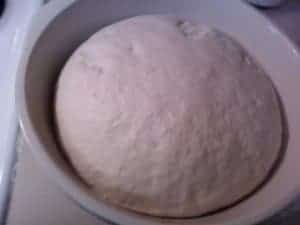 It makes it easier to rinse out the bowl, and since I use stoneware, the bowl is warm for the dough. Now cover the dough and let it double in volume. This time will depend on the temperature of your kitchen and whether or not you used any commercial yeast. Without extra yeast it will take anywhere from 4 to 6 hours. With yeast it will be anywhere from 1 1/2 to 2 hours. 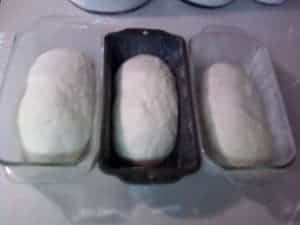 Punch the dough down and divide into 3 pieces. 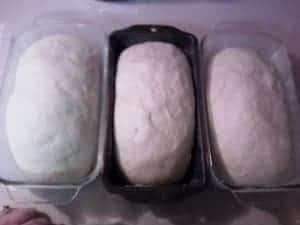 Form into loaves.The loaves will be about 1 1/2 pounds, give or take. Oil the baking pans, (again, I use butter) and place the loaves in the pans. Cover again, and let rise till doubled. This rising should take only about half the time it took for the first rising. When the loaves have doubled, brush the tops with melted butter. This will give the loaves a golden color and a crispy top crust. 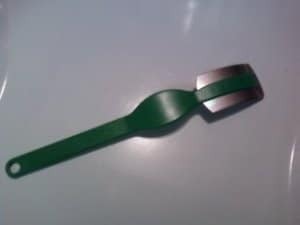 Slash the tops with a lame (pronounced laam), or a sharp serrated knife. This helps the loaves to rise. And then, because I usually have left over butter and because, you know, I like butter, I pour some of the butter into the slashes. Put the loaves in the oven and bake for 30 – 45 minutes. The tops will be golden and the bottoms will sound hollow when you thump them with your finger. Turn out of the pans on to a cooling rack. 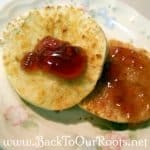 If the bottom crusts don’t have as much color as you would like, put them back in the oven without the pans for a few minutes. If you can resist, don’t slice the loaves until they are cool. 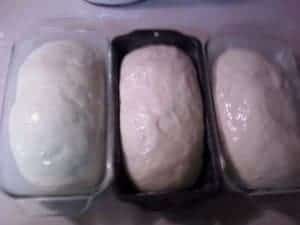 The loaves will continue to cook as they cool and the texture will be better if you don’t slice it until then. But, if you can’t, you can’t! Spread it with something like, maybe butter. And maybe even some homemade jelly. That’s what I do anyway. Thank you for such an informative post about the starter. I’m still confused about one part. If I want to leave my starter on the counter after all the feedings, do I feed it every day? And if so, how much? And would I always need to discard or use part of it? OH!!!! and do you stir before of after you measure for a recipe? Hope that helps. If you have other questions, don’t hesitate to ask! Hi!! 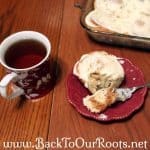 Love your post has so much information……….just one question……..so many recipes say to bake after panning out……do you rise first? Or no? Hi Karen! I’m so glad you liked the post. Yes, you let the bread rise for a second time after putting it in the pans. Sorry if that was unclear! Blessings! I am new to sourdough-ing and have down loaded, copied, followed a lot of starter info and this was the BEST! The forums use lots of Baker terminology and percentages and hydarations and weights that my head was so confused. I’m not as intimidated now! Thanks so much! I’m so very glad that you found the directions easy to follow! 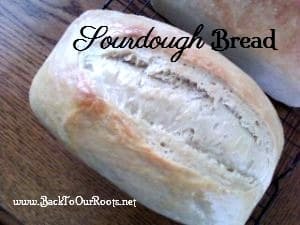 Enjoy the sourdough journey! Ok I have fed my starter for 8 days and nights, but i don’t think it’s rising they way it should. Is it ok to keep feeding it for a few more days? And I just used all purpose flour. I’m going to use bread flour tonight to feed it and see if that helps move it along. And I want to have the tangy sour taste in my baked products, is there anything else I need to do? For the tangy taste you just need to let it rise longer. A slower rise in the fridge will develop the tang more than a quicker rise in a warmer environment. Or just leave out the commercial yeast so it rises slower without being in the fridge. My starter isn’t rising and falling, I’ve marked the jar. I started feeding it with bread flour after feeding it with all purpose flour for a week. I did the fourteen feelings , is my starter just slow ? Should I start over ? Hi Irene! There are a couple of things that could be the issue. #1 is that you may need to feed the starter a little more each time. It’s possible that it is not getting enough to eat. If that is the case, there would be quite a bit of hooch in the jar most of the time. The other possible cause could be the temperature of your kitchen. If it’s cold, it will take longer to rise. If it’s too cold it may not work at all. Same thing if it’s too hot. The ideal temperature is between about 72 and 78 degrees F.
Check those 2 things, and if that doesn’t fix it, let me know and we’ll dig in further! I made your sourdough cinnamon rolls tonight. They are good but they didn’t taste to tangy to me. I had a cup of starter so I added three cups water and three cups of bread flour to it tonight. I want to bake bread tomorrow. I just want to thank you for all the information and help. I think my kitchen was to cold in the beginning that’s why I was having trouble. Since its warmed up some outside my starter has been going good. That’s wonderful Irene! I’m glad it’s working well now. I made the bread recipe , it’s tangy and all but came out kind of dense. I will keep practicing til I get it right. Just wanted to thank you for your help. I’m always in the kitchen making something. You are so welcome Irene! I’m glad you’re having fun with it!